My initial idea when I got my first iPad, an iPad mini (I now use a 10.5 iPad Pro) was to: type up some of my poems, use an art app to do some simple line drawings, perhaps add a dash of colour, print them out – then make some handmade books. Which in previous years I have made before – color copying my line and watercolour paintings, then stapling and binding them together. My books are usually one of my poems, broken into pages, which I then illustrate. I wasn’t really planning to do much iPad art. 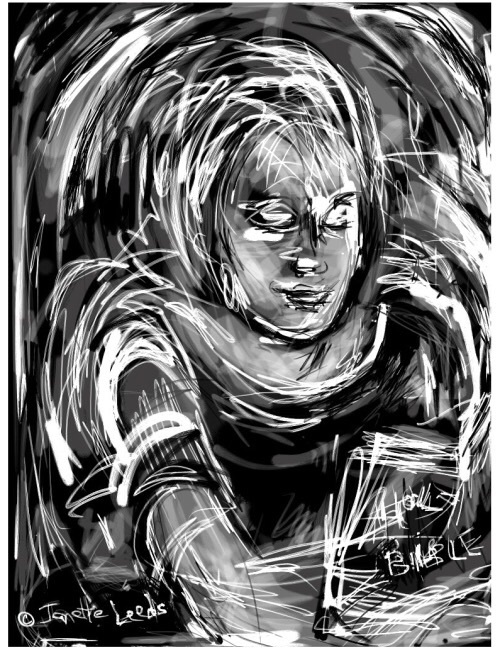 Mainly as the art apps I first tried, had a very basic range of markmaking properties, and didn’t really inspire me. However, I was intrigued enough to investigate further. I’ve discovered there are amazing art apps, with natural looking art media, which allow me to draw and paint, much as I do on paper or canvas! I rarely use a computer (built this website on my iPad). I’ve heard of photoshop, but know little about it. My art training is in the traditional fine arts, so I was thrilled to discover, that very little technical “know how” was needed to draw and paint on an iPad. Mostly, I just dip my finger into the art app media, and off I go! Wonderful! Unfortunately, I can’t offer much information on art apps available on android tablets – don’t know much about them. Searching reviews could be helpful. Nevertheless, most of the drawing/painting tips I share on my blog apply to works on paper/canvas, or any tablet. I’ve experimented with lots of free art apps (most were horrible to use!) also with popular ones that I’ve purchased: Artrage, Procreate, Sketchbook pro… At first, I found their user panels a bit complex (at least for me), and didn’t like the layer systems, which don’t suit the more traditional way I work. These apps seem geared towards people with graphic design skills. However, with a bit more trial and error, I’ve found them quite easy and enjoyable to work in. I still don’t use some of the media, or the layer system – I continue to build up my art on the one surface, as I do on paper or canvas. I keep things as simple as possible. One of my favourite apps is still “Art Set Pro” for it’s beautifully designed user panel, and naturalistic art media. *More about this further along. For those of you interested to learn more about these apps, with layer systems, and see some beautiful accomplished artwork by artists who use them, I recommend an excellent book, by Dani Jones, “iPad for Artists”. This past couple of years or so, I’ve almost exclusively used art apps to do my drawings and paintings, and can now do an excellent quality print of my work from my art apps. Now that I’m using more of my traditional art media, I often use the “Scanner Pro” app, (and sometimes the iPad camera) to scan in my works on paper or canvas, and make “reproductive” prints of them. A couple of years go, when still using an iPad mini, I had an exhibition of my iPad art prints. I emailed the artworks from my iPad, to a local office supplier, where they were laser printed on a responsibly sourced, gloss archival paper. After placing them into frames they came up quite well – some laser printers have very good colour and tonal qualities. In recent times, I do a fair bit of printing at home on my pigment ink air-printer. I particularly enjoy making cards with small prints. There’s more information about these areas, on my page “Printing iPad and Traditional Art“. *I have art prints (and prints on various items) in my Red Bubble shop, here. I use my finger to draw and paint on my iPad, so I can’t offer any information on the pro’s and con’s of using a stylus. I think many people prefer to do their art on a tablet screen with a stylus, and find it difficult to use their finger. It’s worth experimenting to see what suits you. I always have a keyboard attached to my iPad. It’s not only great for typing, but prevents the iPad’s keyboard popping up and getting in the way, when I am arranging my art and words. 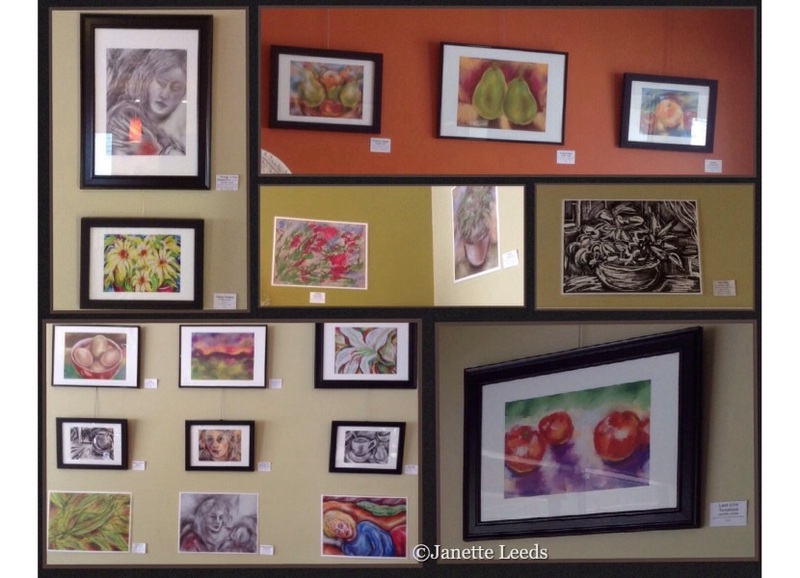 iPad art prints from my cafe exhibition. *Adding a link here to one of my posts, with a downloadable pdf infographic about some apps I use, which you may find helpful. “Art Set Pro” app: really love this app. You can see examples of it’s lovely design in the picture below. A beautiful app – all of it’s tools and media have amazing naturalistic qualities: oil pastels, conte crayon, coloured and graphite pencils, ink pens and more… I’ve occasionally gone to wipe the charcoal off my fingers! As with most art apps you can step your work back if you need to (saves scraping paint of canvas..!) and in “Art Set Pro” you can duplicate work. It can be freeing to know that if an experiment goes very wrong, you still have a back up. For some reason though, I don’t often use this facility, I think once I get absorbed in a piece I forget I can even do that. Also there is a large range of paper/canvas textures and colours. This art app is quite an incredible well rounded artist kit! This art app offers a large range of very naturalistic media to choose from. I painted this in the “Art Set Pro” app. This app has a broad selection of brushes. “Tayasui Sketches“: a very good app; impressed with how generous they are with the free version. Before long I bought the “Pro version”. It was the first art app that really showed me the potential of painting and drawing on an iPad. I use my iPad to scan in artwork using the “Scanner Pro” app, then import the picture/artwork from “iPhotos’, a preinstalled app on the iPad. If shadows creep in on the white areas I remove them in an art app. “Scanner Pro” is an excellent app. I find it more effective than just taking a photo. You can regulate the light and darks of the scan to get it as close to the original image as possible. I also experiment with beginning an artwork on paper (or canvas), then taking it into an art app, and adding line and/or colour work…sometimes into “Art Set Pro” to use (and media) it’s wonderful smudge tools. “Zen Brush“: very rich inky brushwork flowing from your finger tip (or stylus, though I rarely use one) Greys and black ink, lots of paper choice. The eraser can be adjusted to make short/long soft or sharp strokes which I love to use to cut back into my image. “Zen Brush” 2, the new, excellent update, and includes a lovely red ink. I painted this in the “Zen Brush” app. Drew this in the “Crayon Style” app. It provides a white surface. For this drawing I imported in a coloured surface/paper from the “Paint It” app to work on. “Crayon Style” a lovely realistic crayon look, with one smudging tool – unfortunately, it’s not kept up to date by the developers, so I don’t use it anymore. UBrush Pro has lovely media, particularly the watercolours. “Sketch Block” has a lovely watercolour paper surface and I really like the pencil and watercolours it provides. Also it records your drawing and you can have a video made up of it in the app and then send it your “photo” library . Here’s a very quick one below. There’s a video from there into a post called About drawing faces I don’t use this app much any more; it’s one I found when I first began trying out art apps. Now I mostly use “Procreate, “Art Set Pro” and “UBrush Pro”. “Bamboo Paper” app: lovely colours to choose from. It has: pens, pencil, crayon, and watercolour. A simple, easy to use design. It has sketch or note books which open up, and the pages can be easily flipped forward or back. The colours don’t mix as in “Art Set Pro” (which they do in such an amazing natural way), yet some interesting marks and colour variations can be made by overlaying the different media. Pity there’s no smudge tools, however, if you wish you can take the artwork from there, place it into “Art Set Pro” and then smudge it a bit in there, as seen below. The face on the left I drew in the “Bamboo Paper” app and on the one on the right is the same face after using the smudge tools on it in “Art Set Pro”. 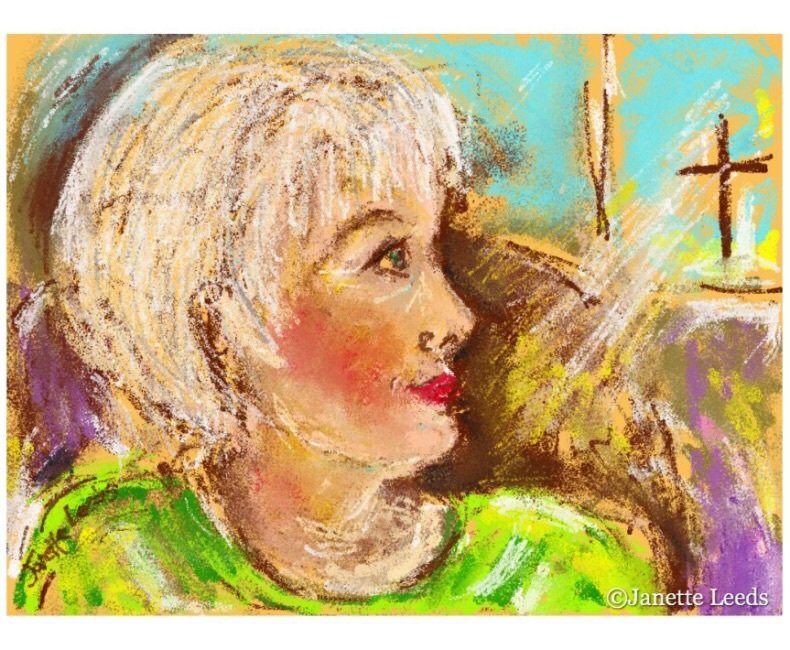 A quick sketch in “Bamboo Paper” app. Used pencil and watercolour. “Draw–n–Show‘: don’t often use it now, but a fun little app. Just some coloured pencils, an eraser and the option to record your drawing process. Here’s a sample video below. “Book Creator” is an amazing app, and was pivotal (as was my iPad) to my plunge into the online world. Here was a way to format my illustrations and poetry into ebooks, and also make them print ready. Much as I have loved making my books by hand (handwriting them as well) time was always an issue, and my general audience rather small. I may still use my handwriting, which I could insert into “Book Creator” as it does suit the personal nature of the content. So many options in this app : fonts, page colours, importing in your pictures/artwork; even video can be placed into your ebook…really worth a look. They have a free version, as soon as I tried that, I was very quick to buy it. “Photos“: this is a preinstalled app on the iPad. Every artwork I do on my iPad, or scan in, is taken into here. It is where I place my artworks for storage, and where I organise them into seperate albums. (Most art apps also have a gallery section for your work.) From “Photos” I also: send my pictures to “Book Creator” or the “Pages”app – I usually print my artorks from there, rather than straight from “iPhotos”. Sometimes I import them from “Photos” into: another art app for further work, or send them into an app for a watermark, or to put other text on them, or into various other apps if needs be, and then back to “Photos” and so on.. The “Photos” app is vital for all my art purposes on my iPad. “Big Photo“: this app came to the rescue, when I discovered I needed bigger pixel dimensions for my artworks. I went to place my artwork into RedBubble an online, print on demand store and apparently I needed bigger pixel dimensions for art prints and for my art to go on most other products. They could only fit my work on phone cases! – I’d calculated differently. My learning curve in all things pixel has been huge, however I still find it a bit (lot) baffling. With a prayer and a search I found this app, which resamples and resizes images up to very large pixel measurements without loss of picture quality. I resized my artwork photos up to 12 megapixels. It worked – an amazing app. “Phonto” is an app I use frequently for for adding text/poems and a copyright symbol and my name on my pics. Also “WordSwag” has interesting preset ways it can arrange your words onto an image . I now work more often in my traditional: watercolours, coloured pencils, acrylics… though I still draw and paint on my iPad. I particularly enjoy experimenting with printing some of my iPad art and applying traditional media to the prints. Or scanning in traditional works, and adding some art app media to them, and so on… Quite spoilt for choices – thankful! The iPad in general plays a valuable part in my art journey. This is a link to a poem, I wrote to/about my pencils and brushes, when I began my iPad art journey. These wonderful art apps, aside from the lovely media they offer, and the time and money they save, particularly suit my artistic style and purposes: doing smallish works, (love minatures), writing and illustrating books. Drawing and painting, whether on paper, canvas or the iPad, is an ongoing learning journey – and good fun! If you have any questions or enquiries, you are welcome to send me a message on my contact page. The various apps and products I share about, as well as any links listed, are to offer you information – which I hope you’d find helpful, and explore further. I’m not affiliated in any monetary way (would make it clear if this was the case) with the product developers or companies, nor do I neccessarily endorse all their products or practices – just saying. 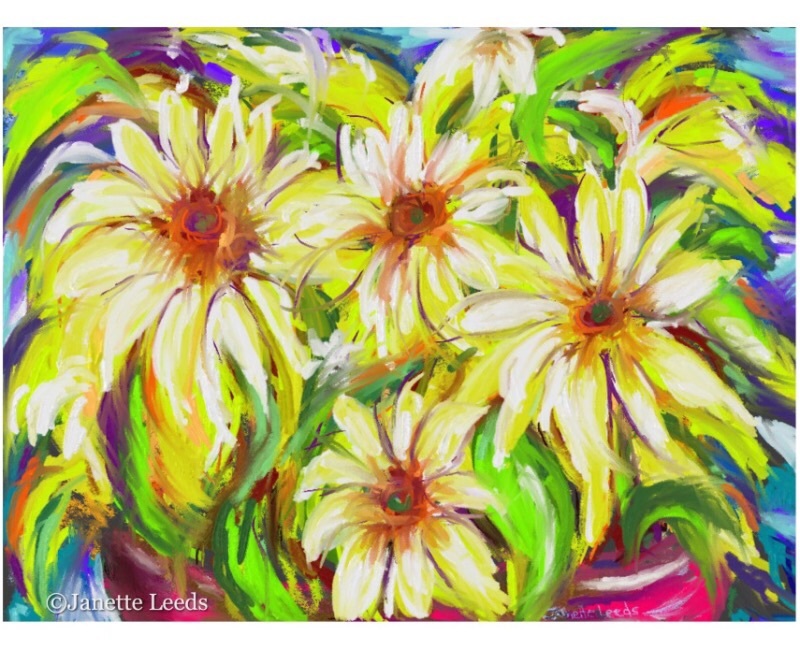 All images and text © 2015 – 2018 Janette Leeds. All rights reserved.